Friday, August 6, 2009—Lucas Oil Stadium, Indianapolis The Drum Corps International World Championship World Class Quarterfinals is about to start with Cascades, and for most people in the stands at Lucas Oil Stadium, this will be the first indication of what drum corps will sound like in this beautiful new and enclosed stadium. I happened to be here for the Music for All Bands of America Grand Nationals last November, so I've already experienced the venue. I'm hoping more fans feel as positive about the stadium as I did for the BOA Championship. Cascades When I heard in January that Cascades were going to return to the field, I was quite happy. 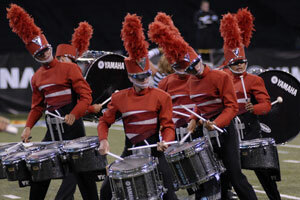 An article I wrote at that time quoted corps Chairman of the Board Mike Bujnowsky as stating that Cascades' return would provide a stimulus to the drum corps activity in the northwest. Just seeing the corps back on the field—coming back at a time when the world economy could certainly be better—is an indication that things are going to be okay for the activity. In a sense, the corps' return mirrors that of the "Beyond the Forest" theme, about the renewal of life in the forest. May the forests of the Great Northwest always witness the sounds of Cascades. Pioneer No corps so thoroughly "owns" a musical genre quite like Pioneer. "Celtic Trinity" is the latest in a long line of Irish-inspired musical books, and as for the word "musical," this might be the corps' most musical show in some time. It can be appreciated for its pure musical sensitivity and excitement even without knowing the theme. DCI's Fan Network commentator track from the Southwestern Championship was quite valuable to be able to pick up all the visual references to the theme. As explained by horn instructor and show coordinator Donny Allen, there are numerous groupings of three this and that, and it's kind of fun trying to keep up with them all. Jersey Surf The members of Jersey Surf had never before been on a tour quite like this one. 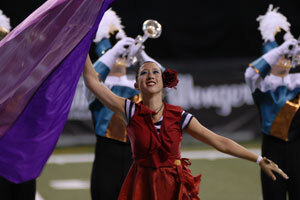 Having been essentially a weekend corps, the organization still stayed close to its roots this first year in World Class, but has been experiencing a major tour of nightly shows for the first time in its history. Considering their performance in Allentown last week was only the second full week the corps had been competing, they've been doing a wonderful job adjusting to the new challenges of being a World Class corps. When one heard the corps was performing "The Mozart Effect," one could have been forgiven for wondering how the highbrow music of the master would fit in with the image of the corps as a fun-loving somewhat carefree drum corps. Not to worry. They've taken Mozart's melodies and injected a healthy does of Jersey Surf attitude. 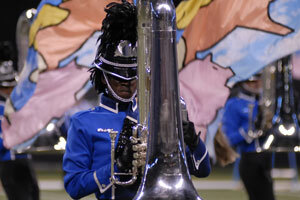 Some of the most imaginative uses of electronics on the field this year have also been introduced by the corps. Pacific Crest We've seen a number of south-of-the-border themed shows in the past, but "El Corazon de la Gente by Pacific Crest is one of the most sensitive ones that have hit the field. While it conveys the flavor of Latin America, it does so with music that captures the spirit of the lives of the people with pure music that isn't stereotypical, but still leaves no doubt about where in the world we've been. I've long admired the way this corps does things. Making the successful leap to World Class a few years ago after several seasons of making sure finances were set up to handle the eventual move, the corps has been a beacon of how to live within one's means and offers a roadmap to other corps that wish to do the same thing eventually. Mandarins What an intriguing concept "Absolute" is. For this program Mandarins have selected some works that alone may not seem to be very thematically driven. However, when taken as being the supreme representations of each musical idiom, the plan comes into focus. The staff brought to the field what they considered to be the "absolute" music in a variety of styles, representative of a variety of moods and identities. 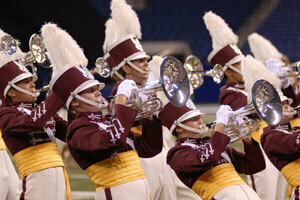 What corps fan wouldn't love to hear "Festive Overture" every now and then? This "Absolute Fanfare" has few peers among openers. Piazzolla's Libertango is "Absolute Passion" and the bold sultriness in the standstill section takes no prisoners. As for "Absolute Joy" and "Absolute Rhythm," Beethoven's "Symphony No. 9" demonstrates that some of the oldest music to hit the field still holds up absolutely well. Philip Sparke's "Partita" is a good vehicle to show that the corps is able to march and play with the same "Absolute Velocity" as the highest placing corps. Spirit I love all the little things Spirit does at the beginning of their program "Live…In Concert!" In order to bring us into the rock show experience. Talking to the performers for sound checks and bringing up the stage lights (via bright yellow flags) makes the sensation of the concert experience more real. Now that the corps has shown that an electric bass can be utilized in a tasteful and most effective manner, I wonder if we'll be seeing more such instruments in the pit to add "oomph" to the horns. My biggest problem with the show is one that's been plaguing me for weeks. I can't get "Dust in the Wind" out of my mind. It keeps getting stuck in my brain and I find myself humming it while brushing my teeth and—more annoying—while trying to sleep. I don't remember ever being haunted by a corps melody like that before. I guess that's a good thing, but it is out of my control. Much of the show has that effect on me. The corps staff is to be saluted for hitting the audience accessible nail squarely on the head. Crossmen One of the things I really like in the Crossmen performance of "ForbiddeN" is how the opening blocks just after the corps' introduction contract and expand. I can't put my finger on it, but sometimes what seems like the simplest movements has the most personal effect. There's a lot of angst in this show, and those early maneuvers somehow capture the intentionally nervous energy that is to come. With the horns and percussion is pure white and black; the introduction of any color in the guard is rather shocking. While the show is a love story, it's not a warm and fuzzy love story. Rather, it seems to be more about what can happen when love is just not meant to be. It's uneasy and occasionally disturbing, like love in some alternate reality where it is fraught with more dangers and trepidation than it is on this planet. However, over the past two weeks, some of the darkest elements of the show have been brightened up with pure drum corps excitement. Madison Scouts This has been an interesting season for the Madison Scouts. 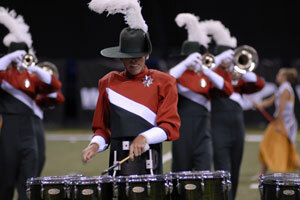 The old Madison brashness is much in evidence during their 2009 production "Rel?ˇmpago," and the corps projects itself like the Madison Scouts of old. The placements haven't been what the relatively young corps was expecting prior to the season; and it's not due to any single caption. But among the most important good news about the organization is that the corps is on solid ground once again, the future is anticipated with eagerness and not concern, the organization is going to have a winter guard to help develop the guard members, interest in the corps remains high among prospective members and the youthful members of today will be the veterans of tomorrow. Overall, the show has all the power one could want from the Scouts and there are many reminders of the searing energy we've come to love from the corps. After spending a little time with corps management this week, I'm excited about what I hear is coming out of the organization. The Academy With "The Ascent," the musical voice of the Academy has been unlocked. We became aware three years ago (when the corps won the Division II World Championship title) just how well the horn line could express massive levels of volume and power. This show has discovered the happy mix between sophistication, accessibility, subtlety and power. This corps can throw down power with the best and with so many of the elements scoring so much better than last year, if they can bottle what they've discovered this year and build it up, it's going to become even more of a challenge for many corps to make it into the World Championship Finals. The color guard is improved over last year and is helping to push the corps forward, but it's that power of the brass that sears my brain cells and what I carry with me when I leave a stadium this year. 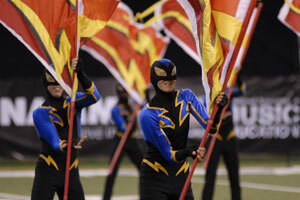 I believe The Academy is destined to become one of DCI's true audience favorites. The arrow pointing to the top just before the end of the show in the drill formation is representative of more than just the completion of the journey to the top of the mountain. Colts In the home tonight of the NFL Indy team, I hope some drum corps fans took a photo of the Colts with the same name emblazoned across the north goal area of the field. It's amazing how the quality level of the activity just keeps getting better, and Colts have likewise improved. 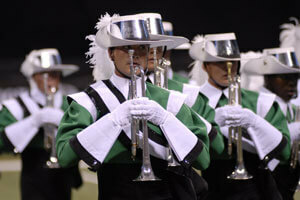 Personally, I think this is one of the best corps they've ever put on the field. Another thing that impresses me about the organization is how they continue to support an Open Class corps in addition to this group. The aura of the open sea is captured in all its glory and all its challenge, from the majesty of "Victory at Sea" through the placid beauty of "Ebb Tide" and the despondency of "SOS." The undulating blue flags of "Ebb Tide" particularly present one of the best "ooooo" moments of 2009, cresting and falling like gulls riding the gentle waves. Troopers What a thrill it has been to see the Troopers do so well this year. Now, it seems only like a bad dream that fans wondered if the corps could ever come back from its year off after reorganizing not that long ago. And now, heading into the Quarterfinals with a legitimate shot at the Saturday night Finals, the Troopers are turning the corner into their next chapter of excellence and entertainment. 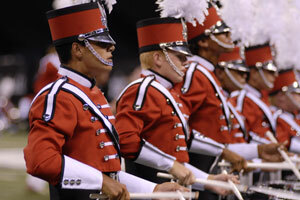 The corps' 2009 production "Western Side Story" is charming in how it melds together music we would expect from the more traditional element of the corps with melodies as diverse as "Cave" and "West Side Story." Part of the pleasing nature of the combination is in the surprise at how everything blends so naturally. And after the beauty of "One Hand, One Heart," the clarion trumpet fanfare seemed to rip apart that heart to the loud approval of the audience. Blue Knights Blue Knights haven't often been known as a corps with an "enchanting" show. "Explosive," "vigorous" and "cataclysmic" are a few terms that could have been used for many of the corps' shows in the recent past, but the corps' 2009 program "Shiver" is downright enchanting. The purity of a Colorado snowfall—covering the fir trees with a shimmering white cover that glistens in the moonlight—is easily as entrancing as anything the corps has ever done in its proud history. We finally get some of the old cataclysm when the horns "roll" into a snowball that tumbles down the mountainside and then explodes in a flurry of ice crystals; but even that is done more with a smile than a gritty determination. For heaven's sake, the guard just got done making snow angels. 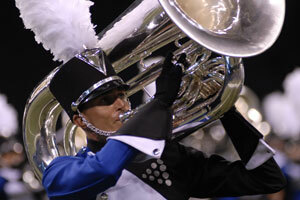 With this show, Blue Knights have demonstrated that the corps can be intense AND cuddly. Blue Stars Blue Stars had quite a scare just three days ago when a freak and sudden storm at their housing location west of Indianapolis damaged most of the stage set tables essential to the show and outright destroyed many of them. But in the true spirit of "The Factory," alumni and fans showed up with power tools and other supplies and repaired what they could. With emergency contributions helping to purchase new tables for those that were damaged beyond repair, it all contributed to the Blue Stars' very own "war effort." The show itself is a travelogue through the days leading up to World War II and the immediate aftermath, capturing the spirit of the nation as all mobilized in response to the attack on Pearl Harbor. At the conclusion of the war, "Fancy Free" fills the stadium with joy in one of the most exuberant offerings on the field this year. Boston Crusaders With its brute power, persistent rhythmic intensity and intense drive, "The Core of Temptation" reminds us of those magnificent Spanish-inspired shows Boston Crusaders presented after first making the World Championship Finals. With an exotic Mid-Eastern flair, the show reminds countless fans why they first fell in love with this powerhouse of emotion. Lest anyone miss the concept of the Garden of Eden, there are a few references to apples in the drill, showing the "before" and "after," when Eve decided to test out her molars on the fleshy fruit. Few corps know how to do "loud" like Boston, and this show does a great job of letting everything cut loose. Old-time fans love Boston for the intensity the members bring to the field. 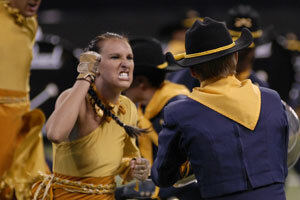 New fans love the corps for…well…the intensity the members bring to the field. 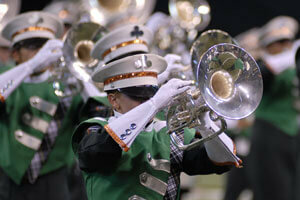 Boston Crusaders are one of the corps that everyone can love for the same reason, one of our true "uniter" corps. 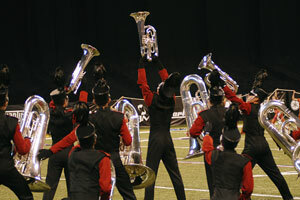 Phantom Regiment A mark of a champion is how an organization responds when they win and when they don't win. 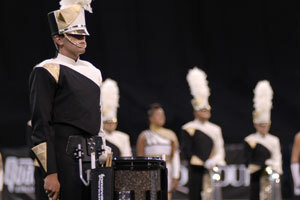 Phantom Regiment showed class last year after their surprise come-from-behind victory at the World Championship Finals and again this year during the season when the corps found itself being announced during the awards ceremony prior to many of the corps it had beaten the year before. One my personal favorite moments in "The Red Violin" is when the four lines of brass re-create the motion of a violin string being plucked, sending the lines and the string into a projection of oscillating sound waves as if seen in slow motion. And for pure "in your face" pleasure, it's hard to beat the soaring mellophone riffs in Benny Goodman's take on the classic Paganini melody. Tonight, the audience showed its appreciation when the brass cut off a chord in the last half of the show that was so perfectly in tune and released, it resonated around the stadium so that all could enjoy it more than just once. Bluecoats If you listened to the Fan Network commentator track for the Bluecoats from the San Antonio show, you will appreciate the extreme amount of thought that went into the construction of their 2009 production "IMAGINE." The tune "Children's Hour of Dream" does a great job combining the esoterically cool and thought-provoking strains of the Charles Mingus source material with the corps' trademark big jazzy sound, making the esoteric accessible. It's intriguing how the protagonist of the show is gradually brought into a world uninhibited by convention, and the sections of the corps removing their uniform jackets as the show progresses has certainly generated more than its share of discussion. But I think everyone gets back on board by "Haitian Fight Song," which is as hot a Mingus piece as the opener was cool. Every corps has to get outside its comfort zone to keep moving forward, and that appears to be what Bluecoats attempted to do this year. I'm happy that they succeeded. Santa Clara Vanguard Many weren't familiar with Aaron Copland's original source material for what eventually became "Appalachian Spring." I'm guessing that quite a few fans have now bought the original "Ballet" (written for just 13 instruments) after hearing Santa Clara Vanguard bring it to the field this year in "Ballet for Martha." When I first saw the show, I proclaimed to myself that in its entirety, it's the most beautiful thing I've ever witnessed on the field. It oozes class from every pore of its existence. One can sense the audience holding on to the edge of their seats, wanting to lean as far forward as they could, but concerned about ending up on the field if they went as far as they would like. 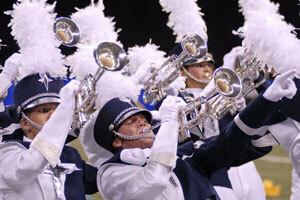 With this show, SCV has learned to wring the audience members' emotions dry. This is one of those rare magical moments that lasts several minutes that afterward, we feel blessed for not only experiencing it, but for being able to appreciate it for all its beauty. At the end, all I could think is that nothing I could write would be remotely adequate to capture the glorious exquisiteness of this production. Holy Name Cadets The corps that started its proud 75 years of excellence as the Holy Name Cadets has returned to the field in a limited run with the same name. This year they're paying homage to the Bernstein music they have played in every decade, with the production "West Side Story 2009: Conflict and Resolution." While watching this show, it's impossible to not reflect on all the innovations for which the corps is responsible, particularly in the style of drill and velocity of marching. And, of course, the innovations in percussion and brass (I'm particularly thinking of the sounds introduced in the pit and the excursions into challenging symphonic music over the years) are not to be discounted. This corps has always had such a complete package; it's inconceivable to think where the activity might be without them. The tribute to the corps' past names with "HNC," the "Garfield Arrow," "CB" and "75" is inspired and a tender homage to the past. 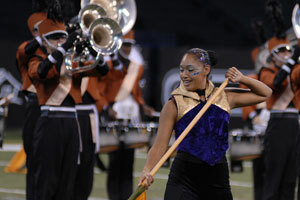 Carolina Crown With the success enjoyed by the corps this season as with "The Grass is Always Greener" universally accepted and loved by both fans and judges, there is no doubt that Carolina Crown is truly a major, major player in the drum corps world. Proving that the pre-show product is now indispensable to enjoying the entire show, everything about this production seems to "click." The extreme amount of body movement that has been so skillfully learned by all the corps members has lifted this production even above that of the wonderfully entertaining shows we've enjoyed from the corps in the recent past. The dissolving front in "The Promise of Living"—only to reappear toward the very end of the show as an evolving front, is a certain highlight that will be remembered for years to come. The animated motions in "Puck One" generated giggles of appreciation throughout the audience. I've always enjoyed the corps' shows of the past several seasons, but this is the first year where I continually found myself wondering, "How do they do that?" The Cavaliers "The Great Divide" can be considered on a few different levels; as a metaphor for getting through life's obstacles, as a literal exercise about spanning great physical chasms of canyons, and as a pure production in the classic symphonic style that the Cavaliers popularized in the mid to late 1980s and much of the 1990s. In many ways, much of the show is somewhat a return to what made the corps so distinctive 20 years ago, and what made the corps continually distinctive for many of the years that followed. Kaleidoscopic drill evolutions and unique pit sounds (such as the blowing of the shofar and the tuned blown water bottles) add to that return of the distinctive Cavaliers style. Much of the show is invested in building tension, making fans await big releases of the tension that are awe-inspiring and mega satisfying. At the end, a member planted a corps flag at the peak of a mountain, signifying conquering the natural elements and achieving a victory of personal endeavor as well. Blue Devils 1930 is the first drum corps show I've ever witnessed that made me hungry for Velveeta, thanks to the vintage radio spots that are played to set the tone of the show. 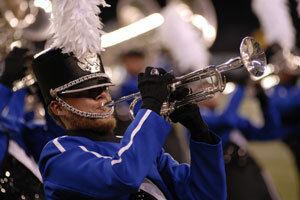 But then, Blue Devils make me hungry for a number of things; mostly more Blue Devils. 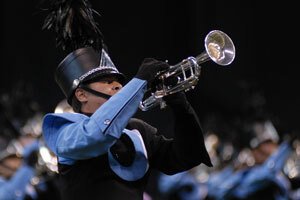 This show cultivates a healthy appetite for that huge, glorious horn sound that no other corps duplicates, with pounding drums that shake the bones and a colorful guard that exudes the confidence that "Happy Days Are Here Again." The corps wrung out all the jazz from Copland's dark "Piano Variations," leading out of the segment about the Great Depression and into the segment of the show that points towards the end of today's financial uncertainty, just like the music that came out of 1930 pointed towards a better era for all. Now about those chairs: There has been quite a bit of discussion about the horns sitting on chairs for part of the show. Well, if everyone did it, it wouldn't be unique. The chairs do a great job of redefining the field and I'm continually impressed with how the corps moves the chairs around the field, hiding them from view until they magically appear in the new location. At the end of the show, my appetite for great drum corps has been satisfied, but I'm already looking forward to enjoying more Blue Devils tomorrow.